Spray 8-inch nonstick skillet with cooking spray; heat over medium-high heat. Add potatoes, vegetables and 1/4 teaspoon of the seasoning. Cook 6 minutes or until potatoes are lightly browned, stirring occasionally. Combine Egg Beaters, cheese and the remaining seasoning; pour over potatoes and vegetables. Reduce heat to medium; cover with lid and cook 8 minutes or until set. Invert skillet onto serving plate. 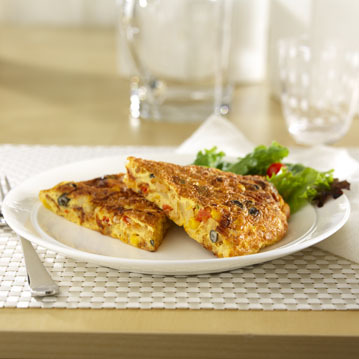 Cut omelet into 4 wedges and serve. If Mexican seasoning blend is unavailable, use 1-1/2 teaspoons taco seasoning instead.